Durable tie-down straps pair quick-release action with a retractable design for easy loading and unloading. Any unused strap automatically retracts into the housing, and you can quickly release each strap by pushing a button. 1,500 lbs Max load. 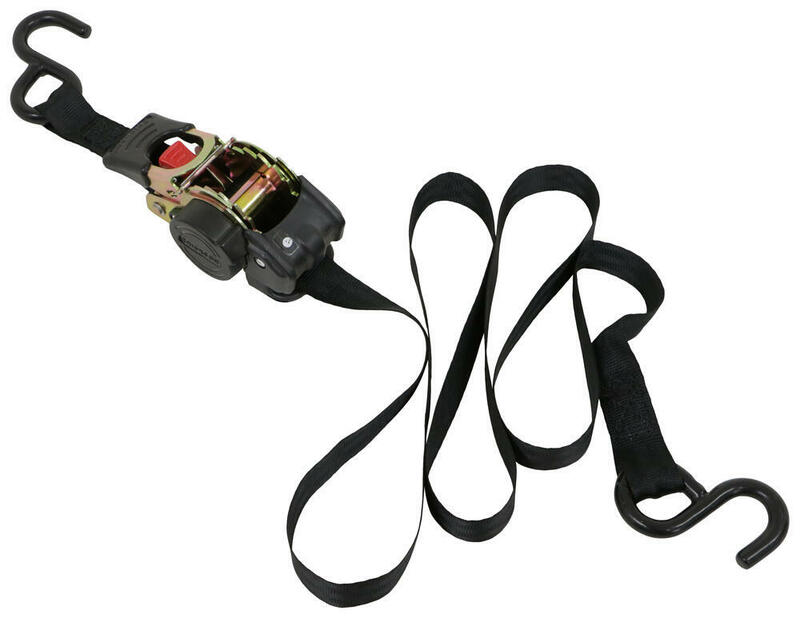 Lowest Prices for the best ratchet straps from Erickson. 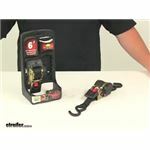 Erickson Re-Tractable Ratchet Straps w/ Push Button Releases - 1" x 6' - 500 lbs - Qty 2 part number 34413 can be ordered online at etrailer.com or call 800-298-8924 for expert service. 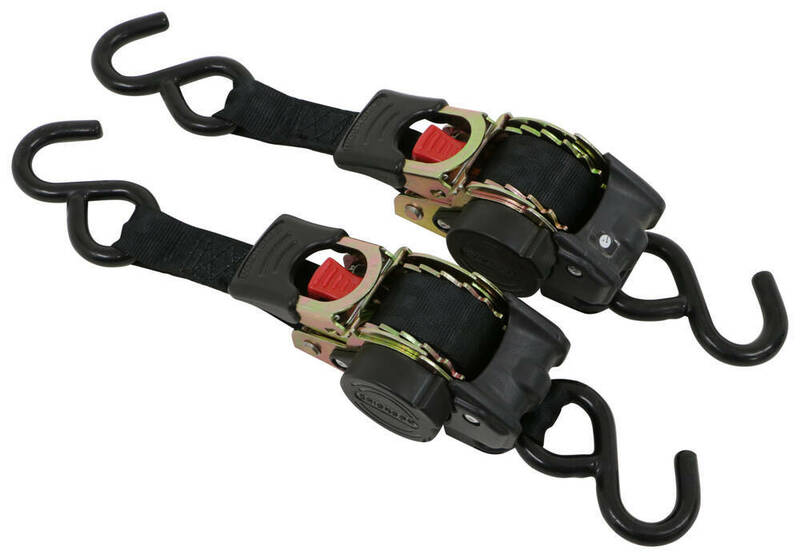 Durable tie-down straps pair quick-release action with a retractable design for easy loading and unloading. Any unused strap automatically retracts into the housing, and you can quickly release each strap by pushing a button. 1,500 lbs Max load. Diameter of plastic-coated S-hooks: 23/64"
Note: Tie-down straps must be chosen according to their safe working load limit (WLL). The weight of the secured cargo must not exceed the combined WLL of the straps being used. For example, if you are using straps with a WLL of 500 lbs each to tie down a load weighing 1,000 lbs, then you need at least 2 straps to safely secure that load. It is recommended that you always use straps in pairs. Heavy-duty tie-down combines quick-release action with a retractable design for simple loading and unloading. Unused strap automatically retracts into the housing, and you can easily release the strap with the push of a button. 3,300 lbs Max load. 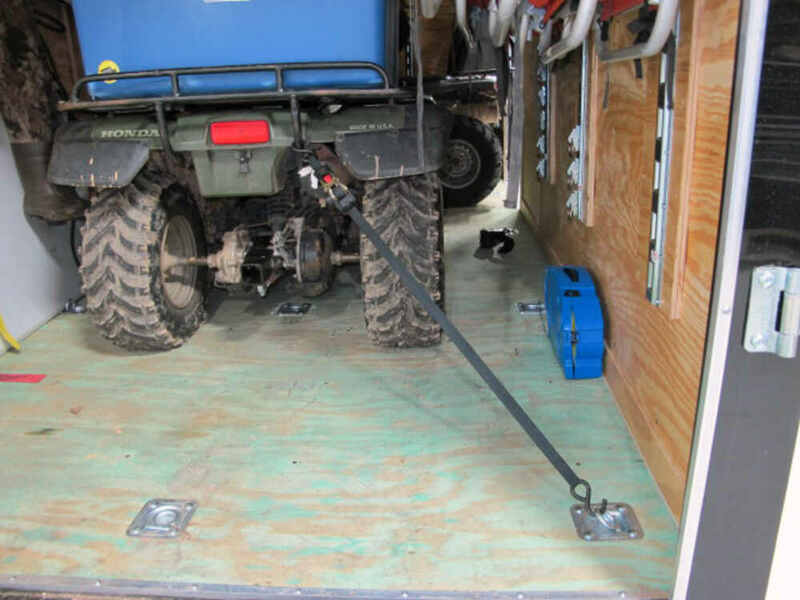 Heavy-duty tie-downs bolt onto your truck bed or trailer so that you can easily secure cargo. Quick-release buttons simplify unloading, and the retractable design keeps straps neatly stored when they're not in use. 4,000 lbs Max load. 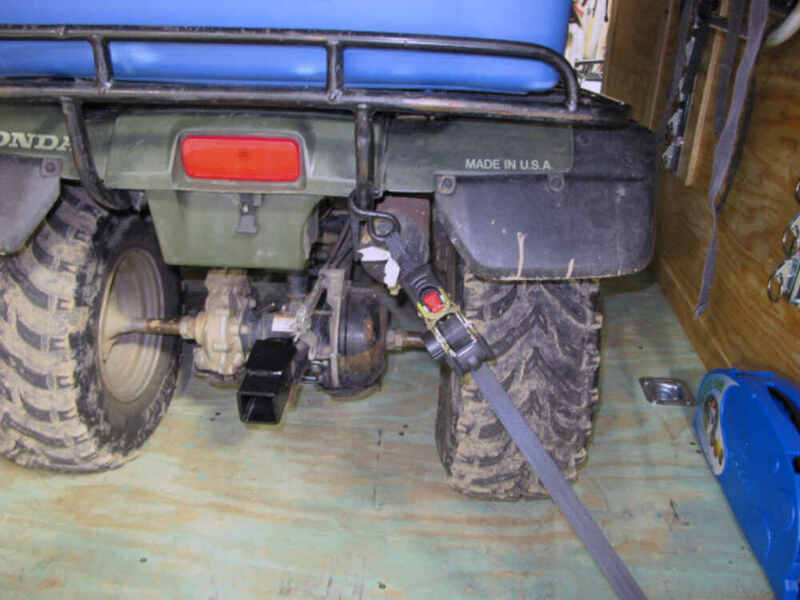 Securing large, heavy cargo is quick and hassle-free with these ratcheting tie-downs that permanently bolt onto your trailer. Heavy-duty straps have a quick-release, self-retracting design for super-simple loading and unloading. 3,500 lbs Max load. 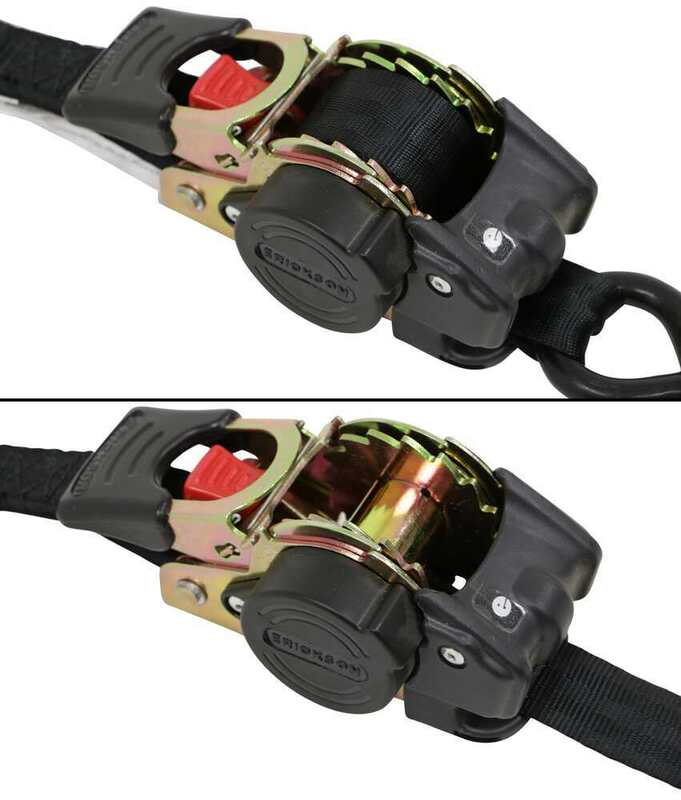 Today we're going to be taking a look at the Erickson retractable ratchet straps. 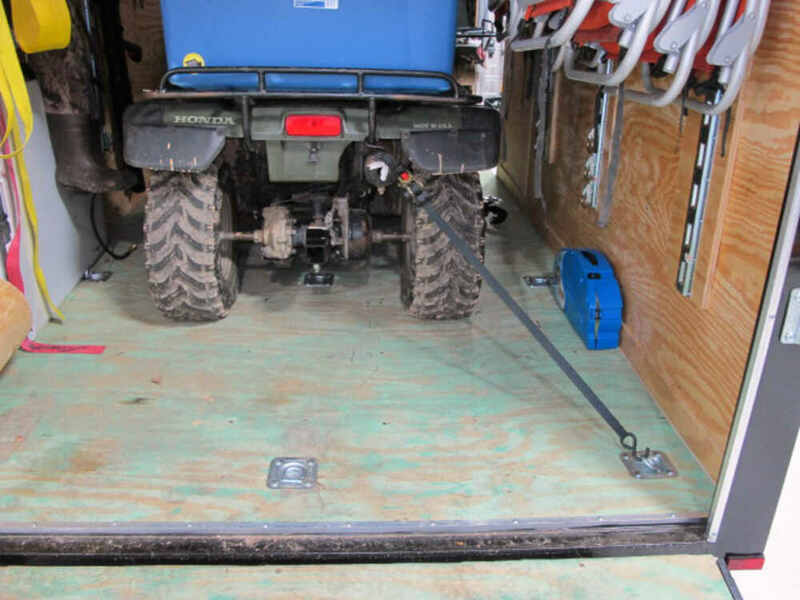 These tie-downs let you secure cargo in your truck bed or trailer. They can be permanently mounted to the flat surface. Mounting hardware's not included. The mount hold diameter here on the bottom of the mechanism measures a half inch. Now, this features a retractable strap, and you're going to get two ratchets with this part number. So the retractable straps automatically wind up into the built-in housing with the push of a button. With the retractable straps, you don't have to worry about excess strap, you don't have to worry about tying off any straps or securing anything. Also allows you to keep the straps neatly stowed when they're not in use, so to extend it out, all you gotta do is make sure this is in the low position, push on the button, extend the strap out as much as you need. Once you have it connected to an anchor point, you can go ahead and use the ratchet here to tighten everything down, and then to take out any slack. 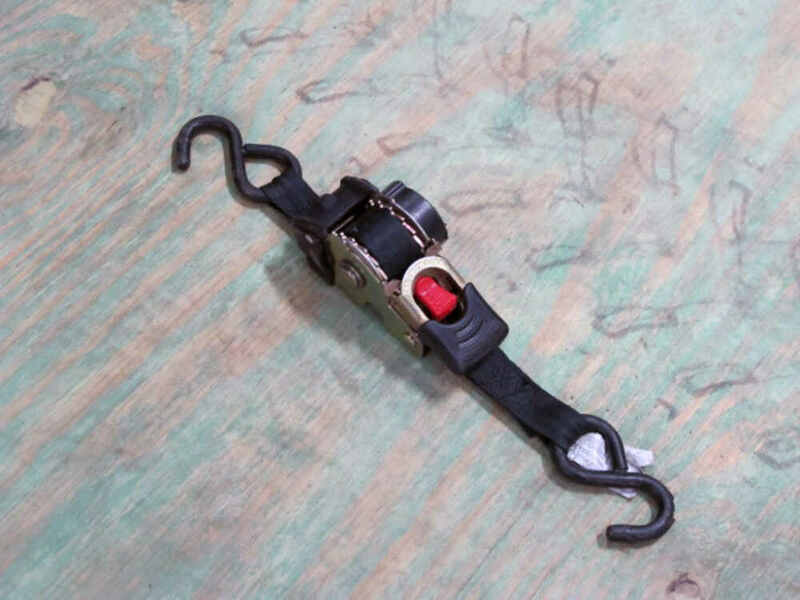 So once you have that connected, you want to take out the slack of the strap and then use the ratchet to finish the tightening process. To take out the slack, make sure this is in the down position. Push in on the red push button there, and it retracts it back into the housing. Really nice, easy-to-use design. 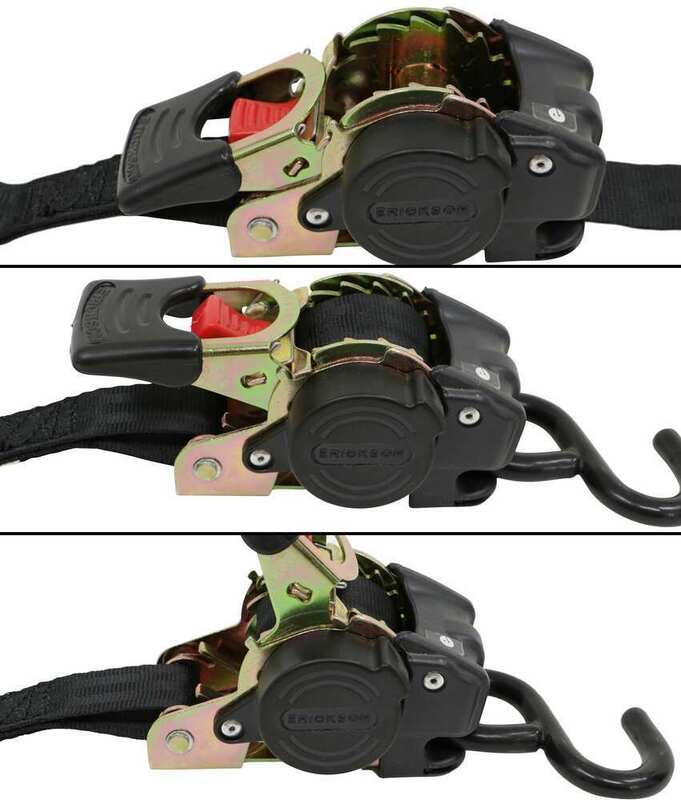 The ratcheting mechanism makes it very easy to tighten down the straps and maintain tension on the straps. It's got a really nice rubber-coated grip here on the handle, just allows you to get a nice, secure grip on the mechanism when you're using it. The S-hooks on the unit are vinyl-coated steel, so it's going to prevent scratches to your gear and cargo. The diameter of the hook with the coating on there is around 3/8 of an inch, and then that opening right there measures about 7/8 of an inch. Each ratchet mechanism features a corrosion-resistant steel body, and the strap itself is made from seatbelt-like material. It's very strong and durable. Now, this is going to measure one inch wide. You're going to have six feet of strap to work with, so one inch wide by six feet long. Each one's going to feature a safe working load limit of 500 pounds with a maximum loader break strength of 1500 pounds, and you do get two ratchet straps with the part number. A few measurements to go over with you real quick. Going to measure the body, so the area that's going to make contact if you do choose to mount this. That's going to give us a measurement of about 3 7/8 of an inch to 3 15/16 of an inch. Side to side, that's going to give us a measurement of around 1 5/8 of an inch. If you have it on a flat surface, it's going to give you an overall height or depth measurement of around 2 3/8 of an inch tall. Now, please keep in mind that tie-downs must be chosen according to their safe working load limit, so the weight of the secured cargo must not exceed the combined working load limit of the straps being used. 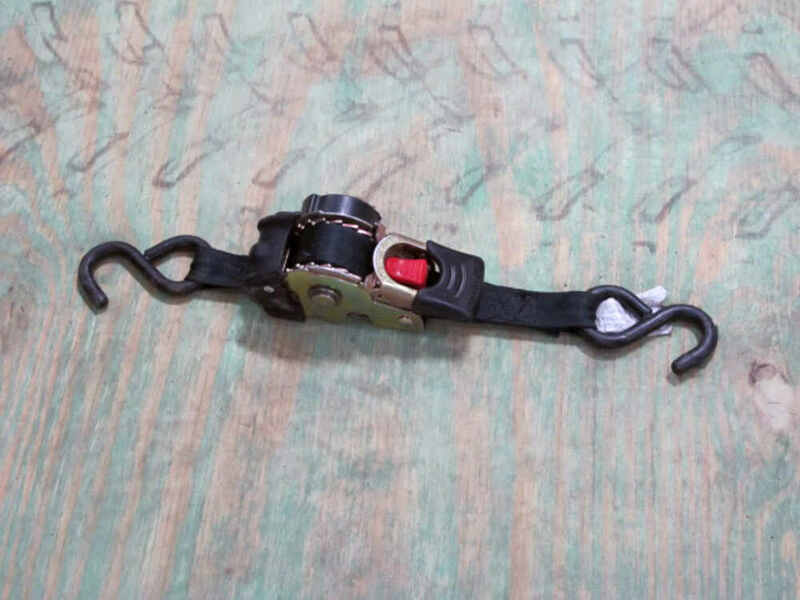 When you have this connected, and let's say you're ready to remove the straps from your load, to release the tension, put that ratcheting handle in the lowest position. 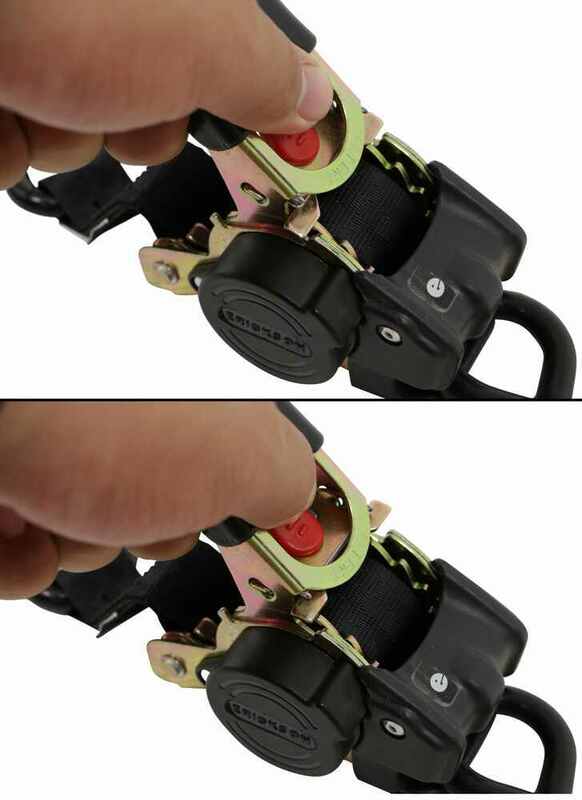 Push in on that red push button, and that's going to allow you to get some slack in the strap, so get your slack, release the button, holds it in place, and then you can disengage the hook from the anchor point. That's going to do it for today's look at the Erickson retractable ratchet straps. Order: RelevanceNewestRating - High to LowRating - Low to High Durable tie-down straps pair quick-release action with a retractable design for easy loading and unloading. Any unused strap automatically retracts into the housing, and you can quickly release each strap by pushing a button. 1,500 lbs Max load. Peter Creager update: They turned into a piece of crap. One got stuck, had to cut the nylon in half in order to free up my kayak. Something inside must of broke. The other one is working fine so far. I would of never ordered this type. I would of paid more money and got a better product. Thanks for reaching out to us. One of our Customer Service team members is following up with Erickson about the warranty. We will be in touch. They continue to perform as needed. No complaints. I am very pleased with both products. I use the tie downs about once a week and they still operate like new. The hitch lifter has been a God send for me moving a folding trailer that weighs about 400 lb. 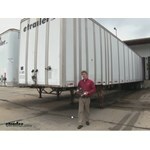 I am 66 with rods in my back and can move the trailer, even uphill on grade with one hand. Do you have a question about this Ratchet Strap? Do the ShockStrap Shock Absorbing Tie-Down Straps Come in a Retractable Style? For your 2015 Subaru Forester that has raised rails that run from front to back the Thule Roof Rack part # TH45050 has been confirmed as a fit and would work well for your vehicle. For load stops for the ladders the part # TH503 would be recommended and then for straps # 34413 for ratchet straps. If your ladders will be 20 feet long on the roof of your vehicle you will need to check your local DOT for regulations on carrying an item that long. The Dutton-Lainson Worm Gear Hand Winch with Split Reel, # DL10952, is not designed to secure the tractor and is not rated for this type of application. I would use ratchet straps like the Erickson Re-Tractable ratchet straps, # 34413, to secure the tractor in the trailer. I have included a link to a video review of these straps below. 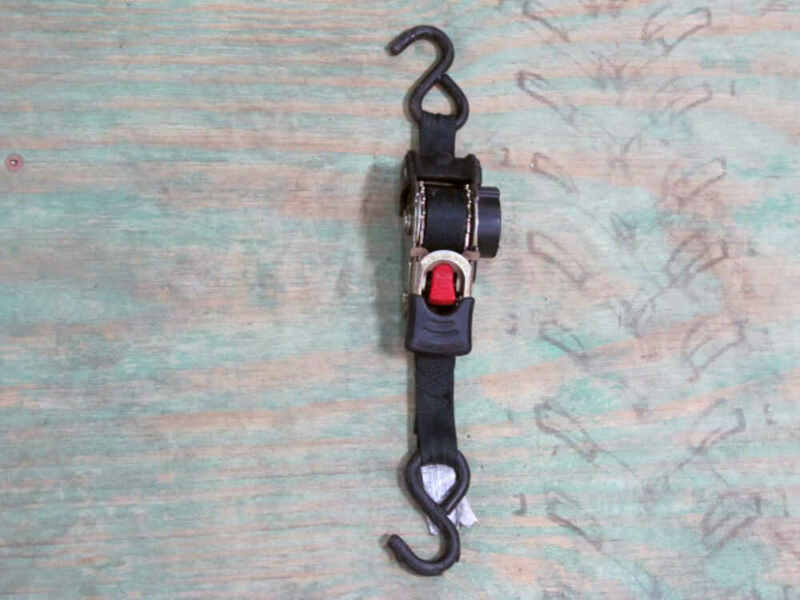 These straps will work well for securing loads but should not be used to hoist or pull the tractor into the trailer. Measurement Of Retractable Ratchet 34413. The Removable Motorcycle Wheel Chock, part # TWSPWM would be an excellent choice for securing the motorcycle to the trailer. 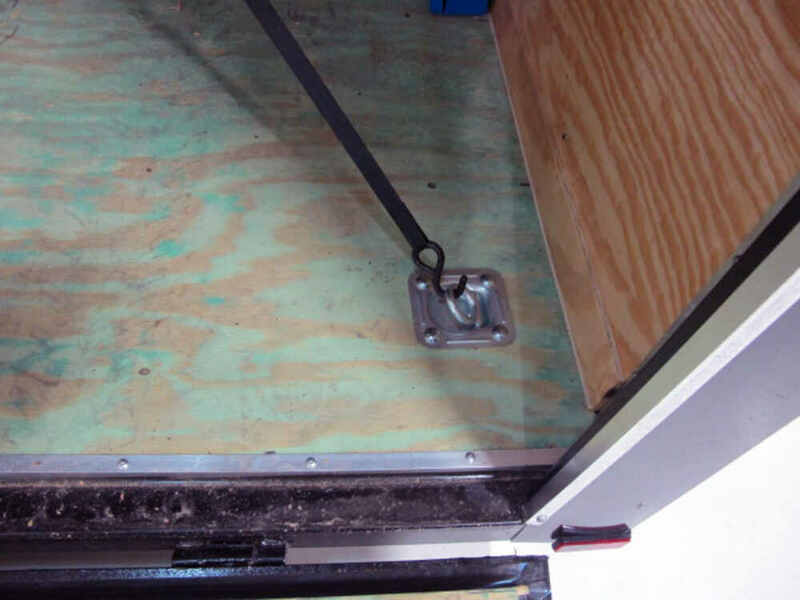 The Wheel Chock includes mounting hardware appropriate for a wood trailer floor. Using something like the Motorcycle Assist Straps, part # 06303 along with ratchet straps like part # 34413 would work well for you. Typically people use load stops as a way to secure ladders on roof racks. For a load stop that fits Thule square bars we have the # TH503. Then for straps we have the ratchet straps such as # 34413 which can be used to secure the ladders to the bars. When the Erickson Re-Tractable Ratchet Straps, # EM34416, are fully retracted, from S-hook to S-hook they measure 18-1/2 inches. Yes, the Rola Flat Strap Cargo Net # 59200 will fit your Rola Cargo Basket # 59504 perfectly. My technical contact at Rola informed me that with the bungee extended you will probably get around 6 inches or so of extension from each strap. If you are planning on carrying a very large load or going over rough terrain, you may want to check out the Erickson Retractable Ratchet Strap # 34413. These straps have a push button release for ease of use. The folding mechanism on the Curt cargo carrier # C18100, or anything that folds, does allow a little play and that could lead to some noise. That is just the nature of the beast. The chance for movement and/or noise is greater if the rack is empty. I have seen some people use bungee cords like # 3044DAT to help control movement when the carrier is empty. Something less stretchy, such as a ratchet strap # 34413, is a better option for that. I went out and pulled a Erickson Retractable Ratchet Straps, part # 34413 from our warehouse to get the dimension you asked about. From the inside of the hook to the nearest portion of the ratchet assembly measures 6-1/2 inches and then from the inside of the hook to the furthest point out on the ratchet measures 10 inches. Highest quality ratchet straps for the best price. Most detailed, accurate ratchet strap information available.